Komos beach is so wide and long that it doesn’t get overcrowded even in the middle of August. It stretches over 2 km along the south coast west of Matala, and is up to 40m wide. This marvelous Komos beach is covered with fine golden sand and framed by natural dunes and cliffs, Tamarisk trees and sand lilies (Pancratium maritimum). 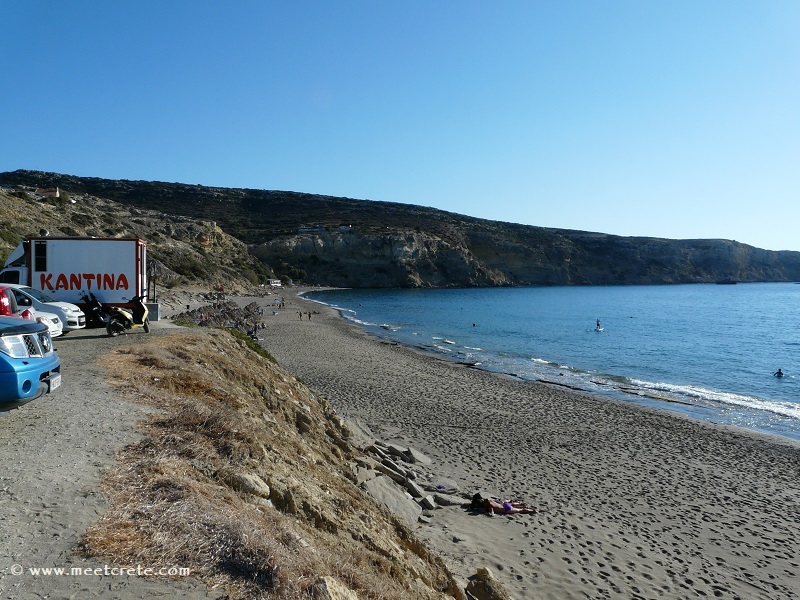 At its western part after the settlement of Kalamaki, it is a paradise for nudists. 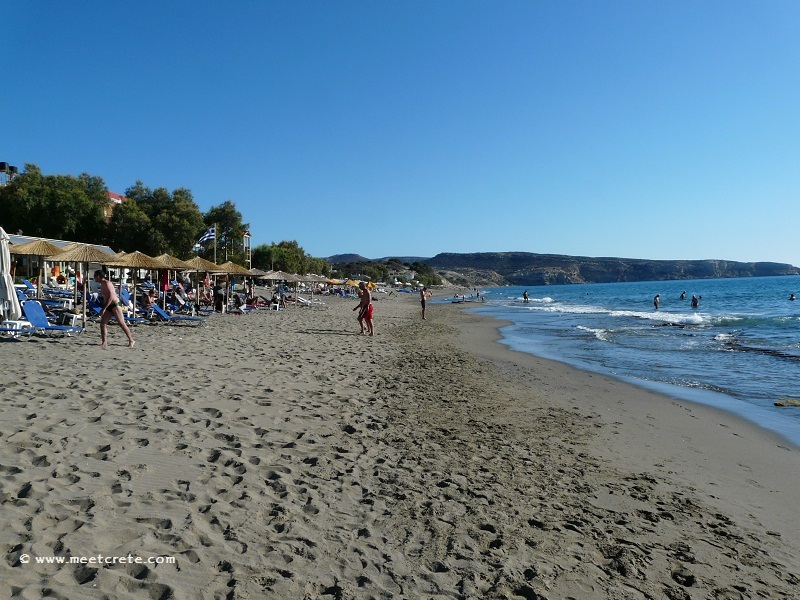 At Komos beach in front of the settlement Kalamaki a lots of sun chairs and umbrellas are offered and the visitor can also choose among a lot of taverns and coffee shops directly at the water front. At the eastern end is a tavern, the lifeguard, umbrellas and sunbeds, as well as toilets and a shower. Though Komos beach is famous for its crystal clear waters and the fine sand, caution is needed because the seabed is covered by a rocky layer, not just sand. The beach is often affected by the strong westerly winds blowing at this part of the island, and especially on those days visitors should pay special attention to the waves. As the evening falls over Komos beach, one can enjoy also the breathtaking sunsets over the Paximadia islets. At the beach you find yourself in the company the of sea turtle Caretta caretta, which buries its eggs in the sand dunes. Please pay attention to the nests marked annually by Archelon (Association for the Protection of the Marine Turtle Greece). Go right to the main parking lot of Komos beach, the archaeological site and a canteen. The archaeological site is fenced (2014) and there is no possibility of a visit, you can watch some details from the main road or from the beach side. Go left to the church of Agios Panteleimonas and enjoy the magnificent panorama view to the Komos bay. From here you can continue on the dirt road and park your car at the southern end of beach. 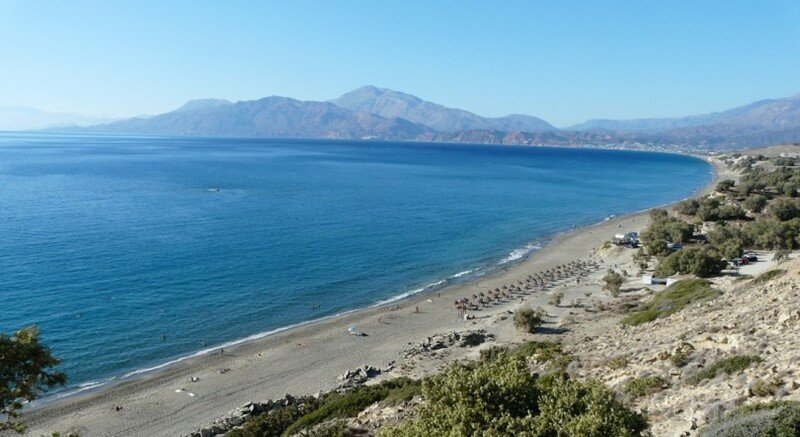 Or drive to the settlement Kalamaki and choose your favorite spot on the beach there.